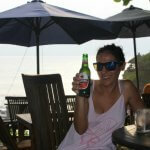 Why we love drinking coconut when we are on holidays in Bali? 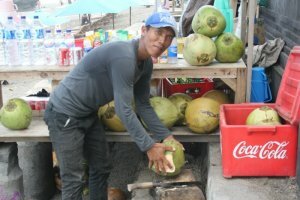 Why you should drink coconut when in Bali? 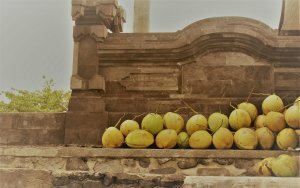 To balance out the previous article, this article is devoted to the old times classic kelapa or kelapa muda or young coconut in English. Did we mention we love coconut? So after one too many bintangs and one too many days in Bali, you decide to do a bit of detox for a change. The easiest way to start your detox is to start drinking coconut. It is sold everywhere from 20.000 IDR at a beach warung to 40.000 IDR at a more fancy place. A small parenthesis here: In Bali, coconuts used for drinking are mainly yellowish / greenish in colour. They are quite big, with a lot of juice inside and with soft yummy skin. The ones sold in the western world, the so called old coconuts (mainly used here for sweets or in food) are brown, smaller and hairy. They have dark skin and less juice that is sweeter. This is simply because it takes time to import them to the other side of the world. • Coconut is sooo cheap so it will not hurt your pocket. It only costs around two to three euros. • Coconut is the perfect drink for hydration as it is rich in potassium, which makes it also the perfect drink after your surf session. • It is fresh and low in calories, a much better alternative than any other soft drink (unless you want to try a fresh juice, also very popular here). • Coconut is good for cleansing. After one whole coconut, make sure there is a toilet nearby as you will visit it many times (I am talking from personal experience here). • It cures hangovers and headaches, much needed after a night out. 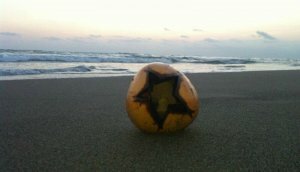 And as with bintang, the best kelapa of the day is the one at the beach at sunset time. Enjoy!